A day late and a dollar short with this Dark Days post, but, to put it delicately, let’s just say that I’ve gotten to know our house’s toilet a little more intimately than I would have liked this week. I’m sitting here with a bottle of Gatorade and a deep desire to eat something more than a saltine, but it ain’t gonna happen. Dorian, my cat, on the other hand, is loving the fact that I’m here all day–I mean, free human to sit on and and annoy and sleep with? Could life be any better? And at least there is a 7/11 one block away from us, which means access to Gatorade and Tylenol and Imodium and all that fun stuff. While I liked parts of living at the cabin for that brief stint, I’ll admit, civilization holds its perks. But, to the Dark Days post. This week we were given the challenge to cook up something sweet for Valentine’s. While I grew up a chocoholic, I somehow lost the sweet tooth over time–my original blog was titled Cupcake Punk for a reason, but now I’d rather just mow down on some veggies or maybe a slice of sourdough bread. Or, really, let’s be honest, a cocktail or glass of wine makes for a great post-dinner sit and chat. So with the idea of “Valentine’s” and “dessert” on the brain, I really lucked out when we traveled to Raleigh and the State Farmer’s Market. Oh, hello, gorgeous solar grown strawberries. We were meant to meet, weren’t we? With the gluten-free experiment still in place, it took awhile to land on the “perfect” dessert to try my hand at. I knew I couldn’t make it super-local since, besides buckwheat (which I’m out of), gluten-free flours are nowhere near local, but I did go the sustainable, fair-trade, organic route on top of the strawberries. And, for all the five years (yes, five years! I’m somewhere around my blogiversary–crazy times) I’ve been running this blog, I’ve never made a raw dish. Nope. Nothing raw. It’s not that I’m anti-raw-foods, it’s just that…well, I like cooking and I’ve never had the patience (or the money to invest in nuts) to carry it out. 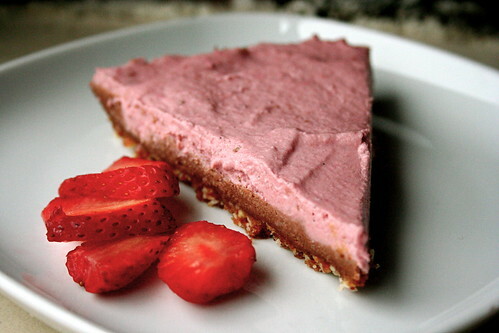 Thus I bring to you a Strawberry Chocolate Raw Cheesecake. Delicately creamy with a punch of bright strawberry flavor, the cheesecake rings perfection. Most of the sweetness stems from the dates in the crust, though a little agave added to the “cheesecake” part sweetens as well, and a pinch of raw cocoa added to part of it lent a nice savory, chocolate note. G & I are both fans of the dessert, and, while I don’t plan on going raw anytime soon, it did give me hope for trying out more raw dishes. Win-win all around! To make the crust, place almonds, dates, and salt in the bowl of a food processor (remember to remove those pits!) and process until fine. Check to make sure that the crust sticks together when pressed. If no, add more dates until it does. Press the crust into the bottom of a spring form pan (I used an 8″ but use a smaller one if you’d like the cheesecake to be thicker). Rinse the processor. If the coconut oil is solid, warm over very low heat in a sauce pan over the stove. Once melted, add to the bowl of the food processor. Add the soaked cashews, lemon juice, vanilla, and agave nectar. Process until completely smooth (this might take awhile). Pour out half of the mixture into a mixing bowl. Whisk in the cocoa powder. Pour the chocolate mixture into the springform pan and smooth out. Add the strawberries to the processor bowl and process until smooth. Add more strawberries until it’s the right “strawberry-ness” for you (I probably used 1.5 cups). Pour on top of the chocolate layer and gently smooth out. Cover with saran wrap and freeze overnight. When ready to serve, let it warm up for 30 minutes on the counter, then cut with a sharp knife. Keep leftovers in the fridge and enjoy! Oh Noes! 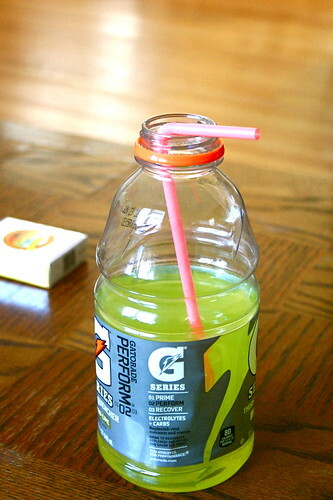 The only time that Gatorade tastes good is when you are ill, though, so when it starts to taste awful again, you’re on the mend. Hope you’re better soon! That looks amazing! I’m kind of obsessed with raw, vegan cheesecakes. I save room to order it every time it’s on the menu when I eat out someplace. Definitely trying this recipe! As obsessed as I am with raw food, I have yet to make a dessert.This looks really perfect. I hope you are not too ill to taste the gorge I’m sure it was? On a dreary day, seeing this colorful dessert just made me smile – and my mouth water! Hope you’re feeling better, Jes. And I like those ginger chews, too. Can’t wait to give this a try. Mmm! Want to make us one of those cheesecakes?! Hope you’re feeling better!! Sounds like the illness is making the rounds but I hope you’re feeling better. The cheesecake sounds…and looks SO good. I love raw desserts! This one looks beautiful and tasty – love the almonds in the crust! I’m sorry you’ve been sick, and I hope you feel better soon. Although, I’ve got to say I’m jealous you have a cuddly kitty. Ours only deigns to cuddle on rare occasions! OK, Jes, I have to say the minute we get strawberries around here (from Carolina in April, and local in May), I am making this cheesecake. I can get raw nuts at the Coop. Coconut oil, I suppose as well. Hope you are feeling better. I am hoping to avoid getting sick this winter, but every time I need to see my doctors or dentists for a scheduled appointment I cross my fingers to avoid picking up something in their offices. This looks and sounds delicious. I will add this to my recipe collection for things to make when I go berry picking this spring. 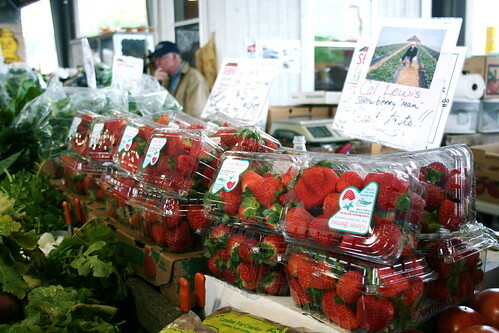 I live in NoVA and am anxiously waiting for May when the pick-your-own farms open. I couldn’t think of anything for the Dark Days sweet challenge, but this looks like a great dish. Mm, what I would give for fresh strawberries right about now… Love that dainty pink color! Raw desserts always look so impressive, and this is no exception. This looks beautiful! We have strawberries here in SC too! Hope you are feeling better. yummmmmm, oh that looks fantastic! I miss raw “baking”, hehe. heck, you know what? I just got a job at a raw food empire, if you send me your address I’ll toss you some truffles when I can! promise. ps. those ginger chews are like the best thing ever, ne? I’ve just made this for afternoon tea catchup with my friends and it came out nicely I used honey instead of agave, and I noticed that the base crumbles very easily. I’ve only left it in the freezer for only four hours, perhaps it’ll be less crumbly if left overnight. Just out of curiosity, would it work if I added some liquid to the base mixture for the dates and nuts to stick together?